(it's my Dad's favorite).I was actually trying to re-create an antique wall lamp found at hubby's family's ancentral home in the province. I used empty bottles and jars and this is how it turned out. Its not exactly a lamp but maybe if I could ask hubby to find a way to drill holes through the glass and insert wires and a bulb mechanism thingy (don't ask me what those electrical stuff are called) it could be a lamp. You could actually use it as a candle holder. 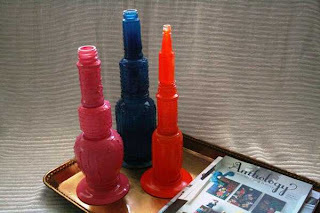 Simply insert your candle at the top. Anyway, for a step by step instruction check this out. This idea is so great. I browsed your old posts and I adore your eco-friendly crafts. I also craft using recycled materials. Hi Irene! I saw this post on Yahoo! and thought this could be an interesting activity for our foundation's livelihood project in Paranaque. Is there any contact number that we could call for a possible collaboration? You can email me at portal_rpn@yahoo.com.